It would not be an overstatement to claim that the state visit of the President of Latvia, Vaira Vike-Freiberga, was a success. To my mind, the event which really marked this visit, was the discussion focusing on the role of small states in a new, enlarged European Union. The Aula Magna of the Old University was packed with people - the Maltese public responded magnificently to the invitation of the Latvian President to discuss this important issue. I must congratulate all those who took part in that event. During her hectic visit, Madame President found some time to open officially the Consulate of Latvia in Malta. It was a brief ceremony, though resplendent in significance. A bilingual book on Latvia (in English and Maltese) was presented to the Latvian President, and she demonstrated her appreciation. 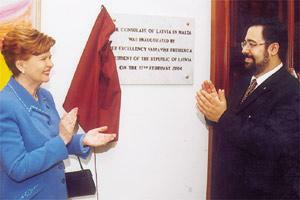 Diplomatic and consular relations between Latvia and Malta were established in 2001. Consular relations are different, though related to, diplomatic relations. It is not uncommon for many lay people to believe that a consul is a diplomat. This is, at best and to borrow the expression frequently used by renowned English jurist Ian Brownlie, "an eccentric view". It is true that the Vienna Convention on Consular Relations is modelled on the Vienna Convention on Diplomatic Relations. It is also true that, by and large, the same rationale behind diplomatic privileges and immunities applies also to consular relations. But, being a consul and being a diplomat are two distinct roles. Put in a nutshell, the difference is that the diplomat works within the political dimension - what could be termed the macro-level of international relations - whereas the consul's functions are to assist private individuals and to promote non-political relations between the sending and the receiving states, the consul's involvement being in the micro-level of international relations, as it were. This distinction is so basic that international practice allows the appointment of consuls among nationals of the receiving state (what is usually called the honorary consul), but does not envisage the same appointment on the diplomatic level. It follows that the honorary consul does not find himself in untenable positions of conflict of loyalties. I like comparing the honorary consul to the village lawyer - if that dramatis persone of Maltese society still exists... The village lawyer might side with one of the two band clubs of the parish yet, if a supporter of the other band club needs legal advice, the lawyer will give his services professionally and irrespective of club allegiance. The same applies to the consul who renders his services to the nationals of the sending state, irrespective of his (the consul's) own nationality. The non-political nature is the quintessence of the consul's role in international relations. This principle has been enunciated time and time again by many national tribunals. In the US case Daniunas vs Simutis, the court held although the Soviet annexation of Lithuania was not recognised by the US, the court still recognised the consular document in question because it was related to a private matter. Another case goes back to the 1930s, when the American consul in Naples was instructed to authenticate the seals of Albanian officials, although the US was not recognising Italian sovereignty over Albania. It could be said that the non-political character of consular relations derives from the functions of the consul. The Vienna Convention on Consular Relations, the European Convention on Consular Functions, and customary international law acknowledge that the consul's paramount responsibility is to assist nationals of the sending state who are in distress. Other functions include the development of cultural, economic and scientific relations, notarial, judicial and registrar duties, supervision and assistance to navigation and aviation, and so on. Some countries ask their consuls to promote tourism above all else, for instance. Due to lack of manpower or adequate finances, small or poorer countries tend to resort to the appointment of honorary consuls - that is, the appointment of nationals of the receiving state to represent the interests of the sending state in the former state. It is controversial whether honorary consuls and career consuls should be afforded the same treatment. Certain eminent jurists argue that given that all consulates are the embodiment of the sending state's presence in the receiving state, there should be no distinction in the way the head of mission is treated - whether he is a career or an honorary consul. Nevertheless, these countries feel safe to resort to such appointments on the basis of the essentially non-political character of consular relations. It is not uncommon for diplomatic staff to perform consular functions. This was the stance taken by the socialist countries, out of purely ideological reasons. These countries also argued against the office of honorary consul, and against the promotion of trade as one of the consul's functions. One doubts whether such considerations are still relevant nowadays, and certainly a re-evaluation of the consul's role in today's world should be undertaken. Notary Mark Anthony Sammut, LL.D., M.Jur., was appointed Honorary Consul of Latvia in 2001. He submitted a thesis on Consular Law for his Magister Juris (International Law) degree, for which he was awarded a Distinction in 2003.